Glucosamine & Chondroitin occur naturally within the body, located in joints and connective tissue and are essential for the maintenance of joint health. Glucosamine is an amino sugar sourced from mollusc shells and is then combined with a mineral salt to make capsules. Our Glucosamine formulation is combined with Potassium mineral salt rather than Sodium mineral. This premium product is manufactured using only the highest quality raw materials to offer you exceptional value. Note: Do not take glucosamine if you are allergic to shellfish or any of the ingredients. Pregnant or breast feeding women and people with diabetes should consult their doctor before taking this product. Ingredients: Glucosamine Sulphate (Crustaceans), Chondroitin Sulphate, Citrus Bioflavanoids, Manganese (carbonate). 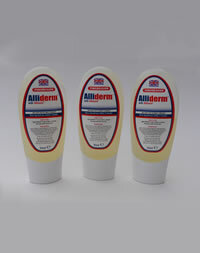 Alliderm Gel (AlliGel) is the perfect compliment to AllicinMax powder capsules.